I finally got some time to post one of my long neglected posts. Life does get quite busy, sometimes, especially when schools are in session. I hope all is well for you. I have missed so many of my WordPress friends. I think life has gotten busy for them, too but I hope they will all be back soon. I made this lentil soup two weeks ago. I used split red lentils because they cook in a record twelve minutes, and do not need to be soaked in advance. I love lentils because they have a high fibre and protein content. 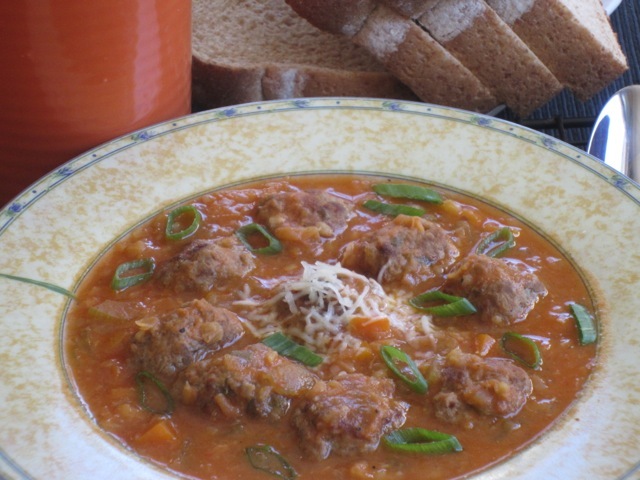 I decided to add some cheesy meatballs to the soup. The soup tasted very nice. It’s the kind of soup I would make, again and again, because we enjoyed eating it so much. 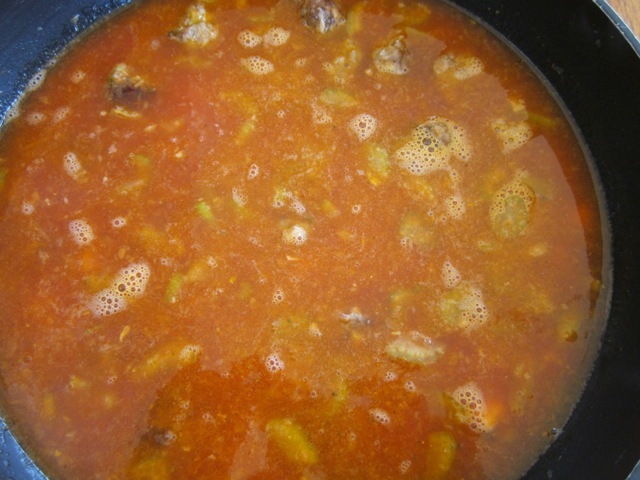 I hope you’ll love the soup too, so click on and check out the recipe. and mix thoroughly with your hands. Wet your hands and shape the mixture into small balls. I made 42 balls. 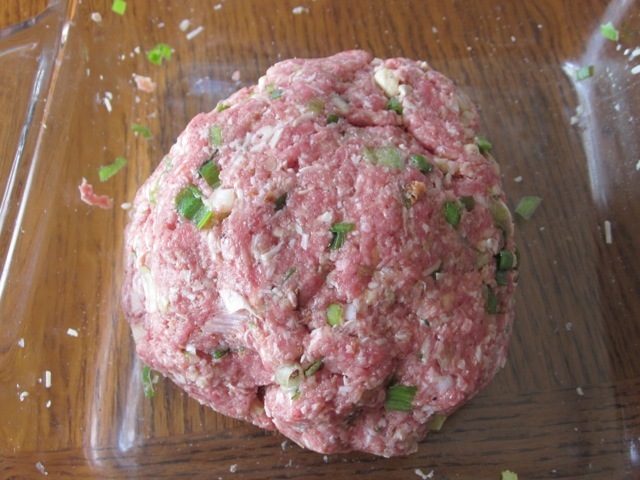 and shallow the meatballs in 2 batches over medium heat until well browned on all sides. for five minutes until soft. and sweat for 5-10 minutes or until the carrots are almost done. 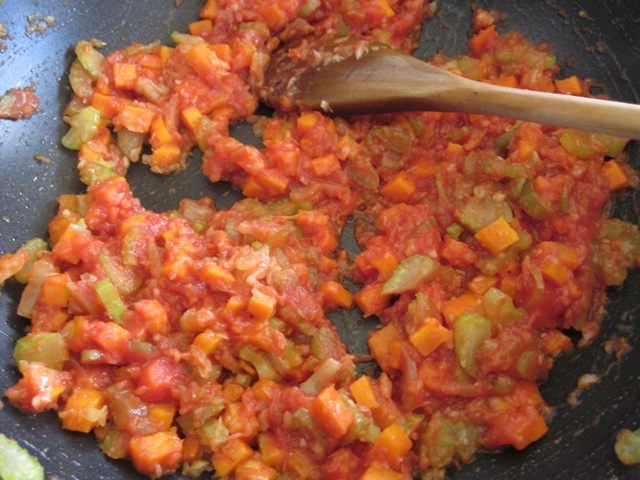 Stir in crushed tomato and stir for 1 minute, until well combined. and simmer for 8 minutes. 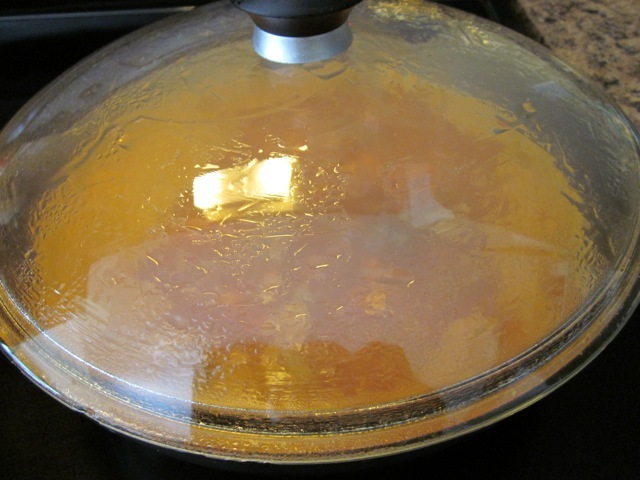 bring back to boil and simmer for 12-15 minutes, until lentils are cooked. If the soup is too thick, add more stock before adding sour cream and spring onions. 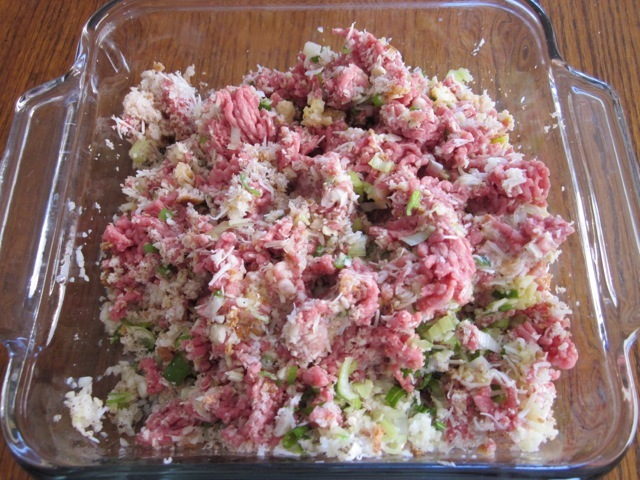 Adjust seasoning, stir in sour cream, sprinkle some green (spring) onions and serve hot. Garnish with spring onions or shredded Parmesan cheese. We really enjoyed eating this soup. 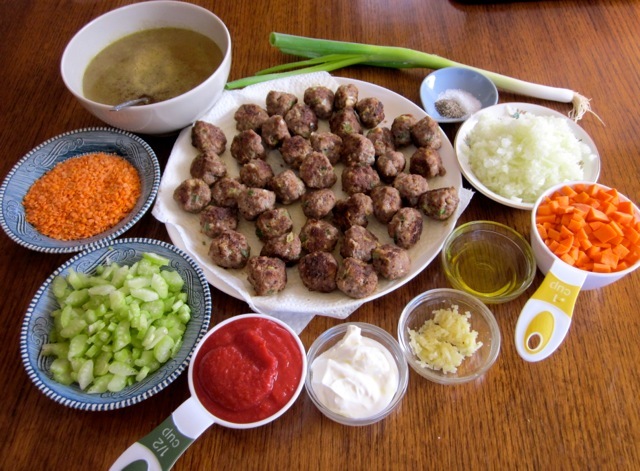 To prepare meatballs: place all the meatball ingredients except the olive oil into a mixing bowl and mix thoroughly with your hands. Wet your hands and shape the mixture into small balls. I made 42 balls. 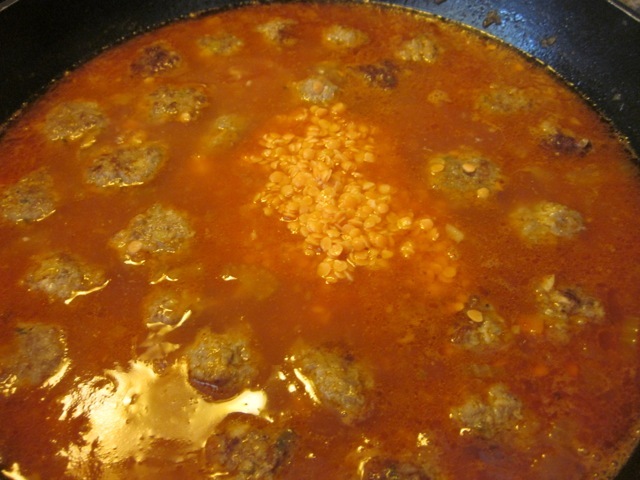 Add 1 tablespoon olive oil to a nonstick pan (skillet) and shallow the meatballs in 2 batches over medium heat until well browned on all sides. Set aside. 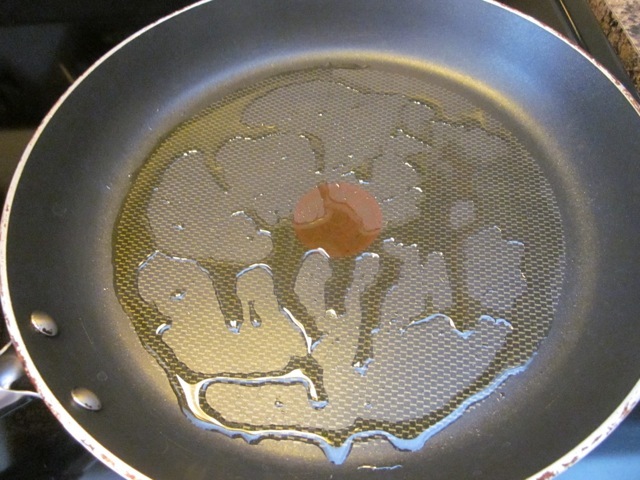 Add the olive oil in a pan over medium heat. 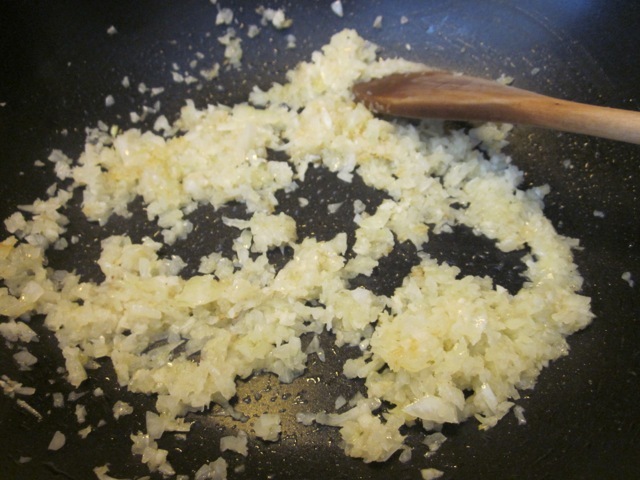 Sauté onion and garlic for five minutes until soft. 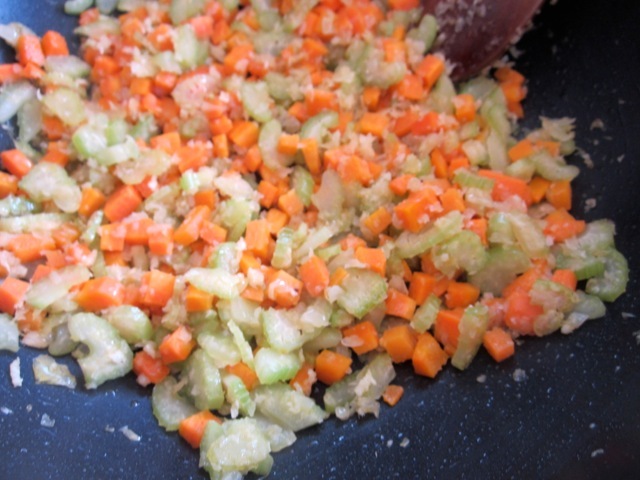 Add celery and carrot and sweat for 5-10 minutes or until the carrots are almost done. Stir in crushed tomato and stir for 1 minute, until well combined. 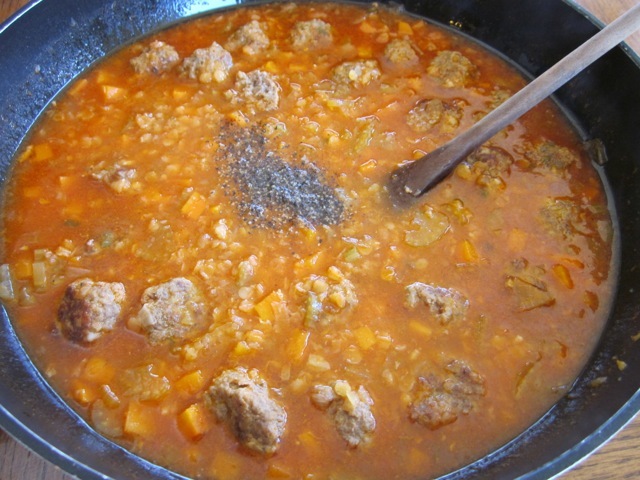 Add 1000ml (4 cups) stock and meatballs and bring to the boil and simmer for 8 minutes. Stir in lentils, bring back to boil and simmer for 12-15 minutes, until lentils are cooked. (If the soup is too thick, add more stock before adding sour cream and spring onions). 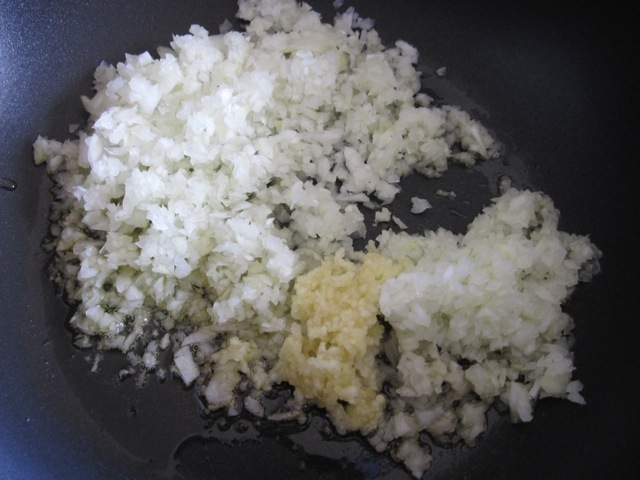 Adjust seasoning, stir in sour cream, sprinkle some green (spring) onions and serve hot. Garnish with spring onions or shredded Parmesan cheese. Thanks so much for advertising my soup on your blog. I’ve totally enjoyed browsing all those yummy vegetarian dishes and wouldn’t mind visiting you from time to time to try your soup version. Do have a pleasant week! I altered this recipe based on how my pantry was stocked and it was delicious! For the meatballs. I seasoned the ground turkey with curry, garlic powder, ground thyme, sea salt, pepper, and poultry season. And I used italian bread crumbs instead of plain bread. As for the soup, I didn’t have any celery so I substituted celery salt as I sweated the onions and the carrots. I used roasted tomatoes instead of crushed or tomato paste. And finally, I added Fage plain greek yogurt instead of sour cream to top it off. It has so much flavor. This soup was truly one of the best I have ever made! Glad to know you’re from Romania. I am not so conversant with Romanian food, but I guess I’ll get to learn from your blog.I just love frying the meatballs first, but I guess boiling is also okay, even my friend from Indonesia says they just boil them. I hope to see you more often. Have a wonderful weekend. I’m glad you make meatballs the way I do. 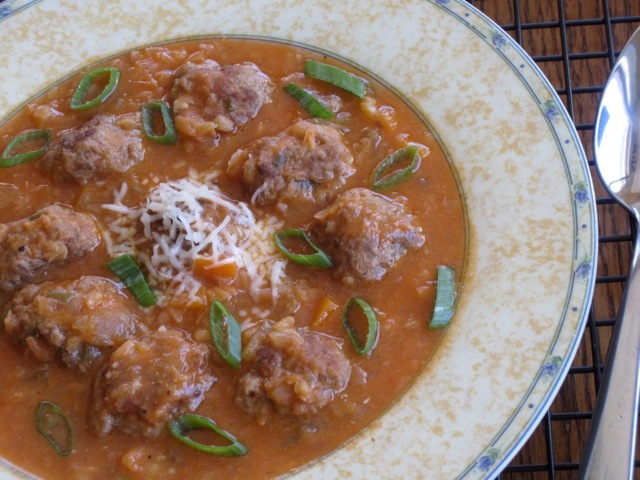 I loved the combination of meatballs and lentils. I certainly enjoyed the soup. Hope you enjoyed your one pot dinner too. Have a great weekend. Good to know. Enjoy your weekend! I am sorry I have been away for the weekend, John. I shut down everything but now I’m back. Glad to see you visited during my absence. 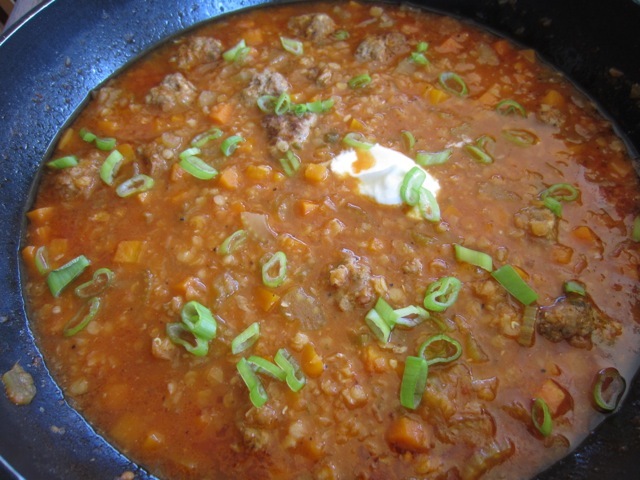 I love lentil soup, especially the split red lentils because they are so easy to make. A bit of chilli adds some kick and the meatballs were really nice because they were cheesy (I added some grated Parmigiano Reggiano). 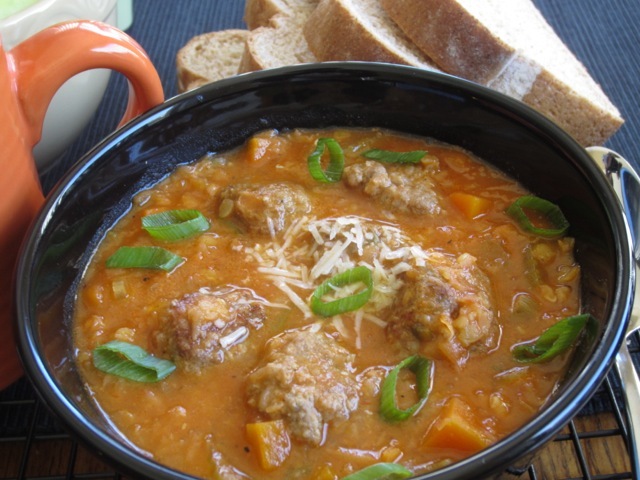 Please try lentil and meatballs the next time you make soup. I enjoyed eating mine. Have a lovely week. Our weekend was full of rain but from tomorrow, it’s gonna be shiny and toasty, but cool in the evenings. My hugs to Max, as always! Best wishes, John. Liz, Looks luscious! 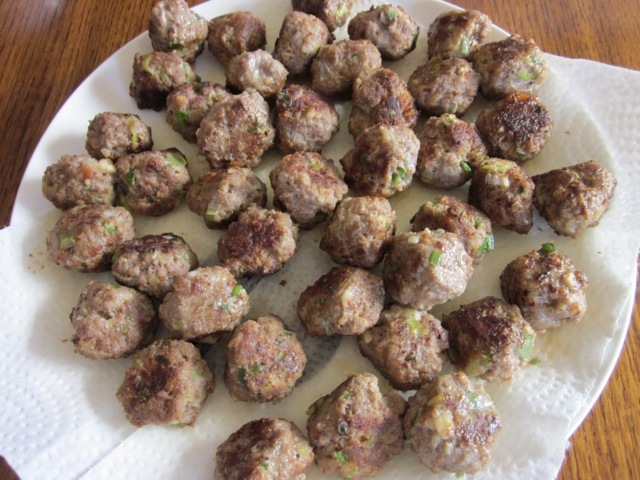 Will have to try – I did the curried meatballs – on my blog-please read it when you have a mo! Thanks for the great recipe!! I have told you again and again that you’re an excellent cook. The meatballs you made, are fantastic. I could just taste them over the screen. Thank you so much Keith, for trying out the recipe. YOU HAVE MADE MY DAY!!! Ha ha, thanks so much Keith. Have a lovely week! lentils and meatball is a divine intervention. No competition there. I am loving this recipe. From what cuisine does this recipe come from or is it your own creation? I love lentils but I wanted something different so I made this combo. This is absolutely my own creation. I love mixing things here and there all the time. I don’t believe in maintaining order in cooking. It tasted good. I would make it again and again. Thanks for complimenting. I loved your govt shutdown creation. Have a lovely day! You are a cook from the heart. Love it. Come to NYC and lets cook together. We can definitely loose track of order!!! I am well known for not following rules. Now, I have to make this recipe. Thanks for liking my post. Thank you so much for the kind words. One day I shall come to NYC to taste your food. I have a sister who lives in NJ. One could never enjoy cooking if rules were followed to the letter. who created thee rules anyway, just people like you and me. Thanks for stopping by and have a lovely weekend! Let’s keep in touch. I’d love to have you over for dinner when you come to NYC. I’ll not forget that. If ever I’m crossing the border, I shall let you know. Thanks so much for your kind invitation! I am so glad to hear that I inspire you. I wish you a happy cooking and please enjoy the soup! It was in Malaysia, a few years ago. I bought an Indian snack which was very spicy but delicious. The seller told me that one of the ingredients was lentil. 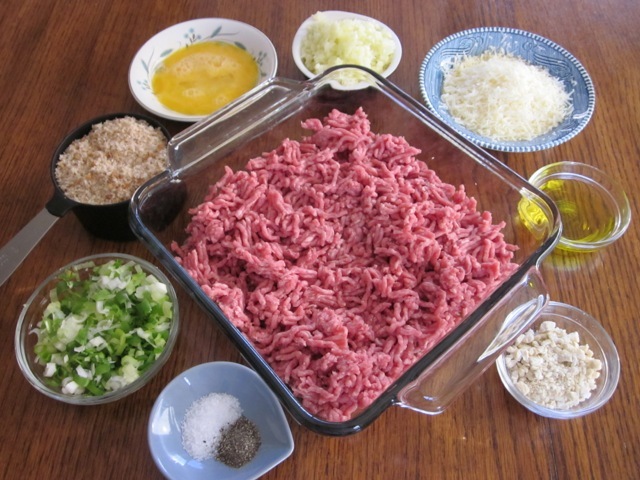 The Chinese folks in my hometown love to ball up the minced meat and cook it in soup, too! But we usually boil it instead of pan-fry it. Great to see you. I think I know what you’re talking about coz I really love Indian snacks and sweets. It was probably a lentil Bhajia. I love them too, so much, except I don’t know how to make them. I always visit the Indian Sweet Marts just to eat those snacks. They are very delicious. I can imagine the soup from your town, boiled to perfection. I would love to try that too. Thanks for visiting and have a lovely day. Hey you wake up very early. Did you sleep last night at all?? Best wishes! Ah, I have been having problems sleeping lately. I keep waking up after sleeping for an hour or so. I was just going back to sleep. Okay, Hari. Enjoy sleeping in. You should just relax and stop thinking about your sleep problems, the more you think about it, the less you’ll sleep. Have a lovely day. I’m just preparing to have dinner now. Best wishes! Ha ha missed ya too. Yes, I eat very diverse food…ouch. But I love it, so much. Happy cooking! Enjoy the weekend, ahead! Hey Liz! You just keep adding to our “to do” list, stop it! Lol…seriously adore lentils…must post our chicken mulligatawny soup with lentils, at some point. So going to do this. Can’t remember if we told you we made your curried meatballs? They were totally delish and to die for! Don’t worry. I have a ‘to do list” several Km long, and it does have some windy corners as well. I love lentils too. Hey I would love to see the mulligatawny soup with lentils (I can’t even pronounce the name, seriously). Omg, you made the curried meatballs? Thanks so much for telling me. I’m really glad you made and LIKED THEM as well. That so cool…thanks you’ve made my otherwise dull day, very bright. I wish you a happy evening. Thanks for stopping by. This is actually 3 recipes in 1. The meatballs and the soup would be good meals on their own. Thanks. Yes it was a really long post but worth every minute spent. I agree with you. Have a lovely evening. And tastes seriously yummy too. Enjoy your day! I am a big fan of lentils! Love all that protein and fiber. I make several dishes and hope to post soon. I have never put in meatballs with them, this looks great. Can’t go wrong with any kind of meatball if you ask me. I was even going to make a lentil stew tonight, but it is supposed to be in the upper 80s today and I am rethinking that plan! Enjoy the rest of the week. It always a pleasure to read your comments. I love lentils too. They are healthy, friendly to the pocket and you can mix them with anything you conjure. I love that they cook very fast too. Enjoy your lentil stew whenever the weather allows. Best wishes to your family. I hope to make some lentils next week. Right now I have so many different leftovers! Enjoy the weekend. I am having left overs for dinner tonight. What a relief, no cooking tonight. Enjoy your weekend too! I made a soup tonight to go with left overs. More left overs tomorrow too! Enjoy your weekend. Thanks so much for your friendship. I really appreciate! 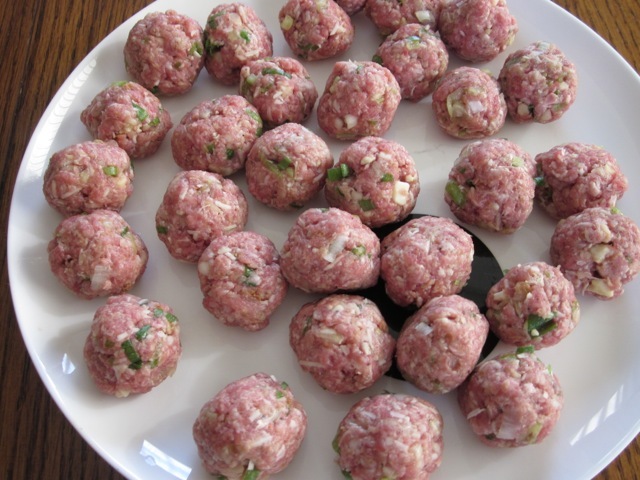 Meatballs are a big favourite in our house and these look delicious! I love meatballs too and my kids adore them. Thanks, for complimenting. Enjoy your evening. It’s that soup kind of weather isn’t it? We here on the west coast are enjoying rain and greyness and cool weather. Your soup recipe does sound interesting especially with the little meatballs. Reminds me of a sort of soup dish I made one time and it ended up being so thick it seemed to be a cross between soup and stew so we just called it stoup! I rather like your idea of adding the meatballs. Where do you get all your neat recipes and ideas from. Very innovative. We miss you too Liz, but understand that each day can bring new challenges and life happens. Take special care of yourself. Just how can one can enjoy rain and greyness? But living on the west coast, I guess you have no choice. 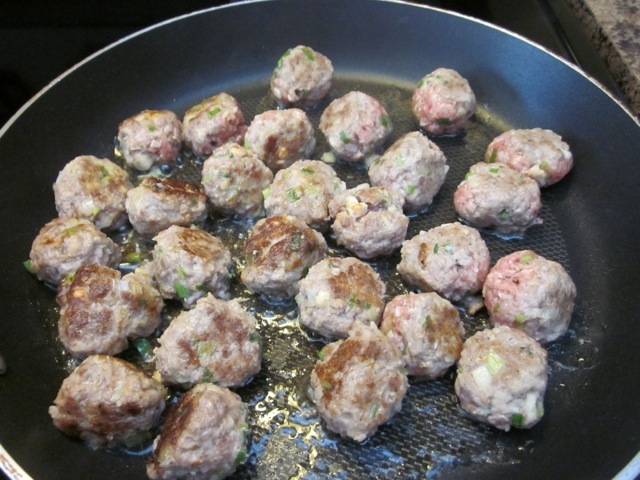 I loved those little meatballs because I added some grated Parmigiano-Reggiano to the meatball mixture. it tasted really good, and cheesy. Every bite left a cheesy taste in the mouth. I think there was a time I made some winter soup and didn’t serve it immediately and the lentils soaked up all the liquid and it become a stoup. I enjoyed the stoup all the same. Wasn’t bad at all, and it was very filling! I browse recipes a lot. I’m one of those people who reads cookery books. It was great chatting to you Sandy. It’s always a pleasure to see you. I wish you a lovely end of week. That’s a cool idea worth trying. Soup for breakfast… You’ve given me something to think about. Enjoy your evening. Mmmm…this looks so delicious, Liz! 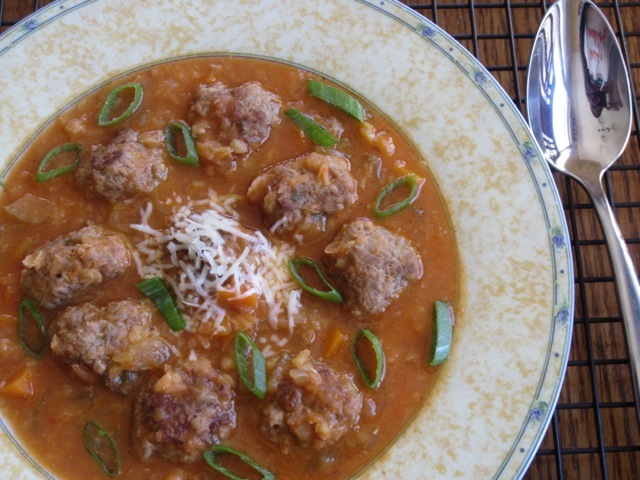 It looks like the perfect dish for the cooler fall weather that is fast approaching. I will make this for sure! The carrots are a nice addition. 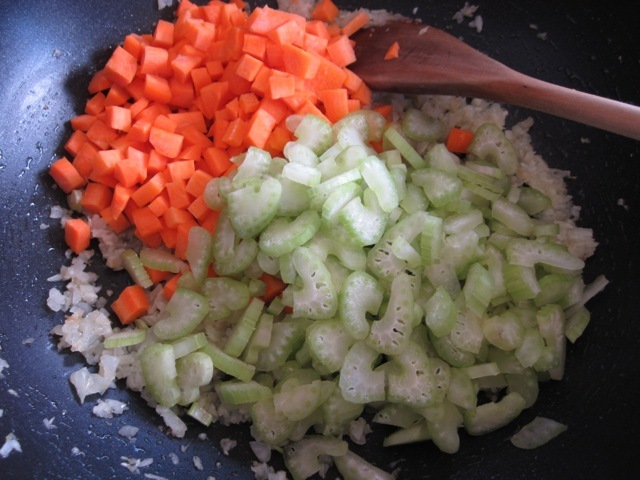 I put carrots, onions, and celery in lentil and split pea-type soups and stews. Hadn’t thought to put in meatballs, but will definitely give that a whirl. You know how much I love eating meat. I sneak it in, in everything I eat, LOL. The soup tasted very nice. I would make it again. Thanks for complimenting. Ha ha, have a good nigh! thanks for complimenting. Enjoy the rest of the week!